CRAZY DISCOUNT! Was: $429.95 Now: $249.97! 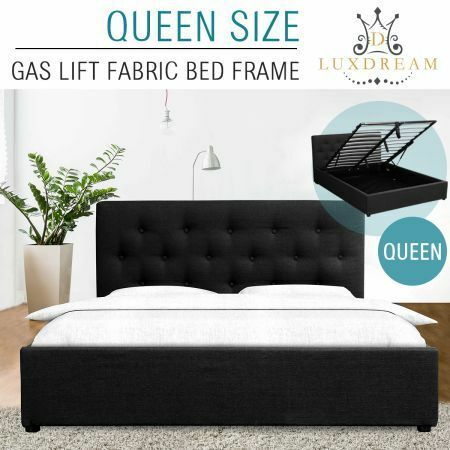 Sleep tight on our brand new LUXDREAM Wooden Queen Bed Frame Gas Lift Storage Bedroom Furniture. This queen size bed fits perfectly with any home décor with its contemporary design. On top of that, it's well constructed, with solid plywood frame, to last and serve you. The large foam padded linen headboard ensures comfort and support while you lean again it reading books or watching movies. Equipped with high grade steel centre rail and sturdy steel frame with wooden arched slat base, the bed frames online are build to guarantee stability and safety. 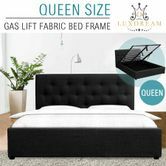 Thanks to the gas lift design, it's also a storage bed providing a clever additional solution for beddings, clothes etc. This upholstered platform bed is an excellent combination of comfort, style and storage! NOTE: Bed Frame Only! Mattress, Topper, Bed Sheets, Pillows are NOT Included.